Whats happened to the front of Robs van? 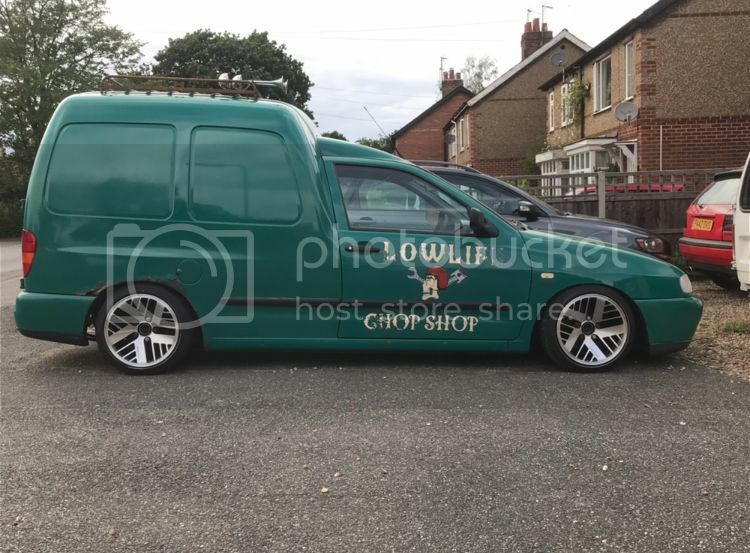 Not sure what’s happened to his van lol. Axle flip and 35mm blocks you will need them. Oil breather popped out the rocker cover. Covered the underside and top bit of the bonnet in engine oil. You do seem to have a few issues Rob! Rob came over yesterday, and helped me strip the front from my green doors van to put it on this van. Everything came off green doors with ease. 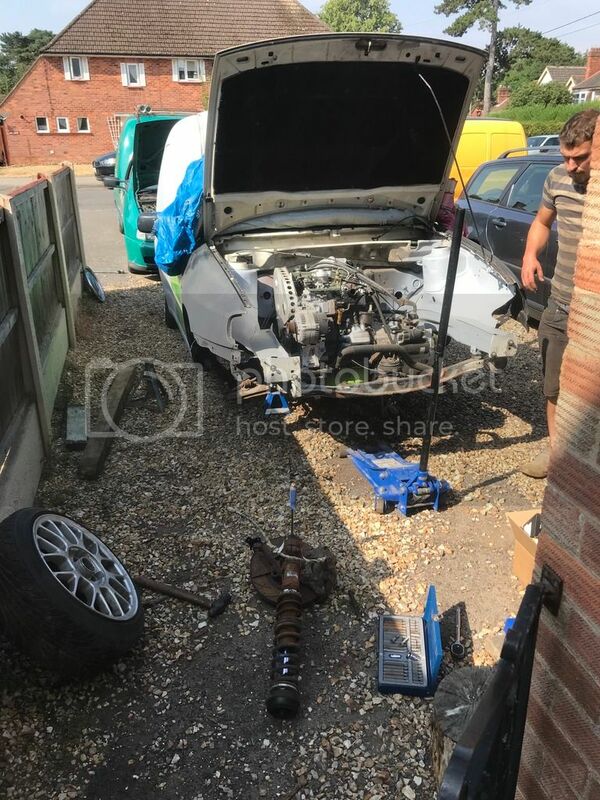 We removed the hubs, brakes and coilovers in one piece. The same couldn’t be said for this van. It was a bit of a pain. 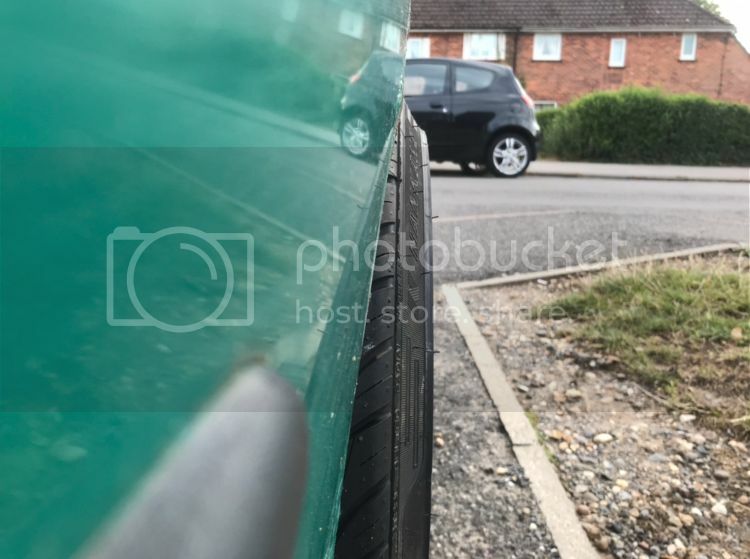 One of the anti roll bar links was snapped so I had to remove one from green doors. I had new bushes kicking about in the garage so I fitted them. 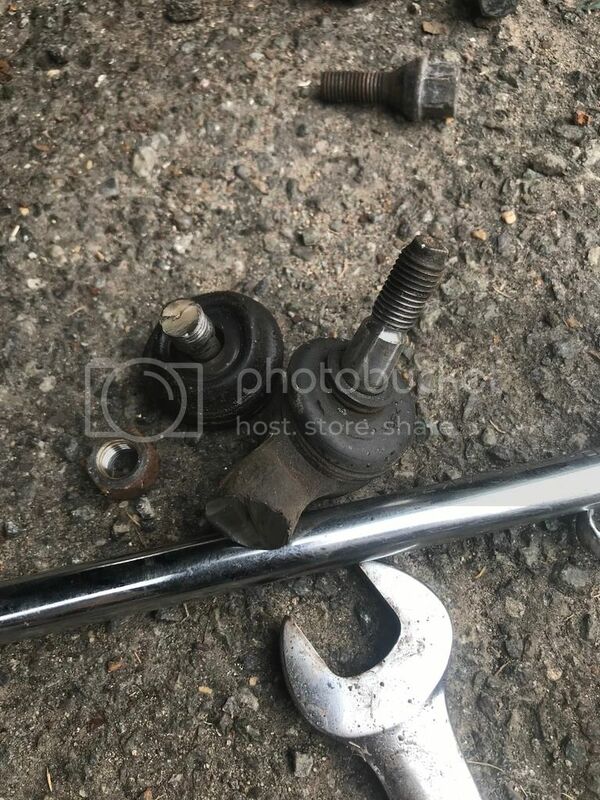 The passenger side tie rod end wouldn’t budge, we didn’t have gas available to heat it so we tried to slit it down the length of the thread being careful not to damage the thread. This didn’t help too much so in the end I cut the joint off the end, ground the remainder into the rough shape of a hexagon and knocked a 20mm socket on it. With the buzz gun it came straight off. 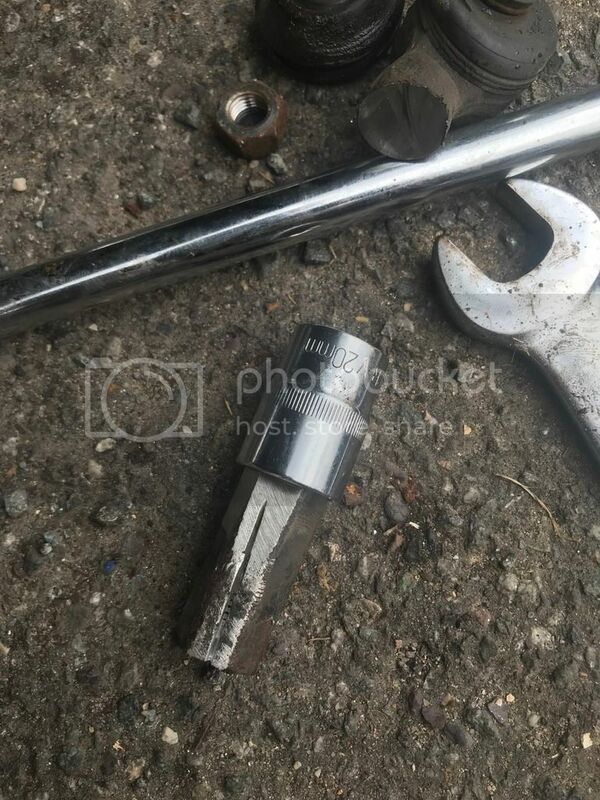 The ball joint on the drivers side was so tight it stripped the threads on robs ball joint splitter so we had to improvise with a bolt and a nut. It worked a treat. 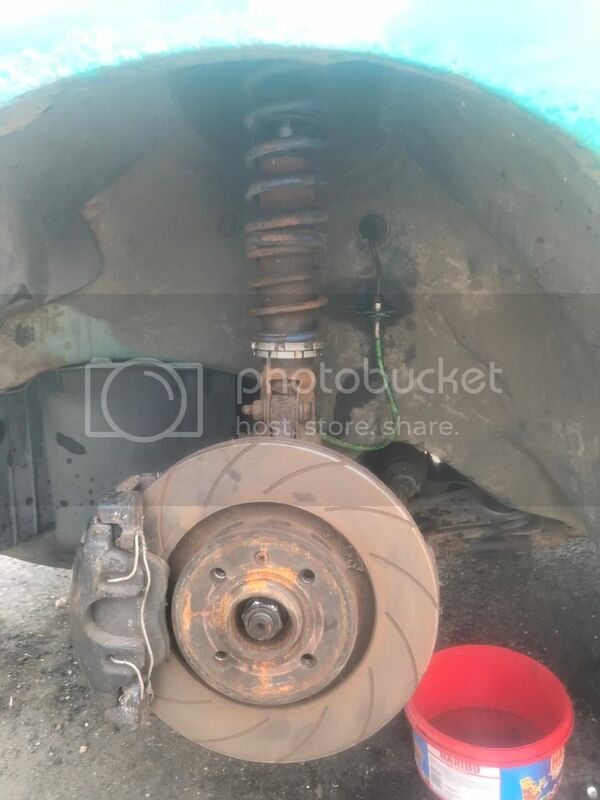 I wanted to fit the 280mm brake kit from green doors so that meant removing the brake pipes, well that didn’t go well either. 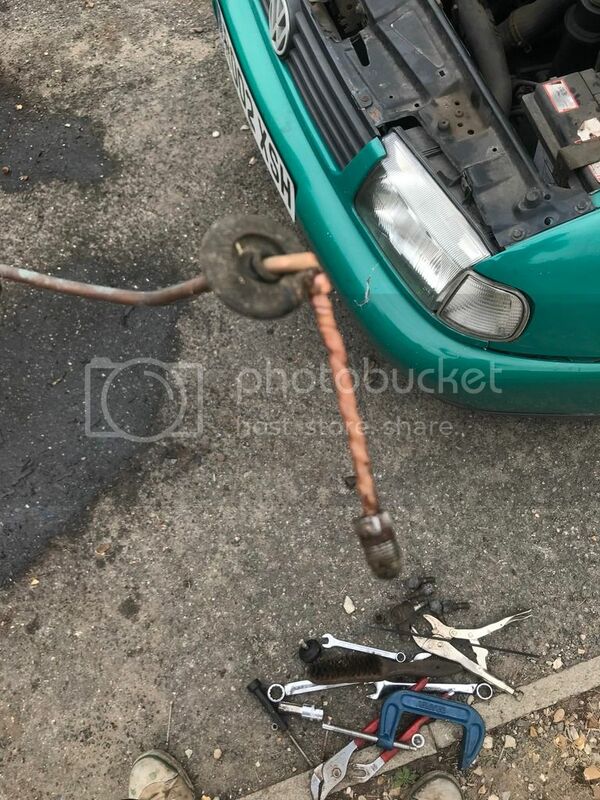 The nuts would turn ok but they turned the copper brake pipe as well. Both sides did this. We ended up replacing the copper lines with the ones from green doors. 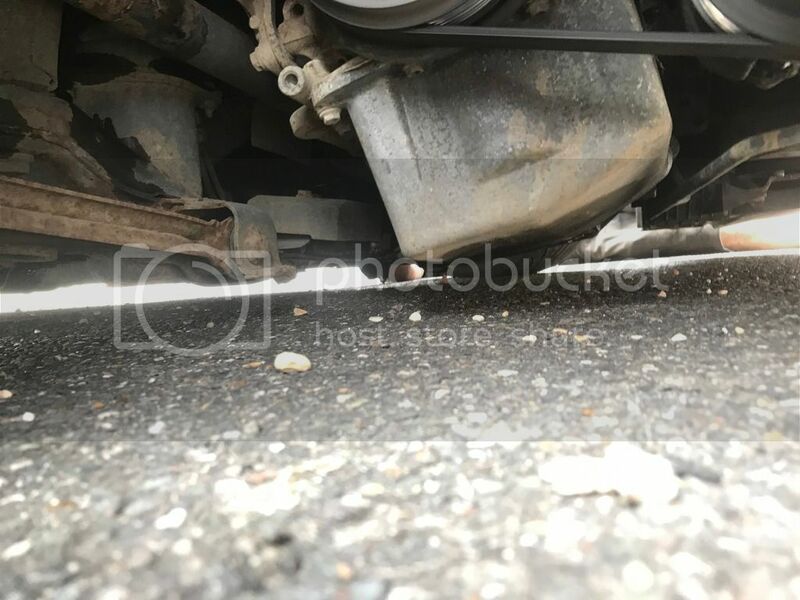 But when I topped the brake fluid up ready to bleed them the drivers one was pouring fluid out of a split near to where the pipe came through the chassis leg. I whipped it back off then we had to manipulate another pipe to fit. 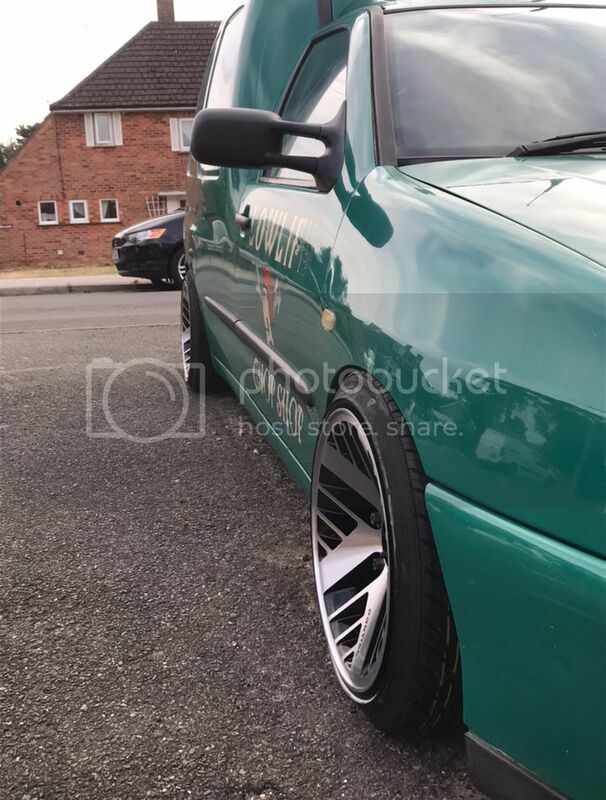 So this van now has my old coilovers fitted, my ball joint extenders, tie rod flip kit and 280mm brakes. I used new ball joints, rod ends and top mounts. 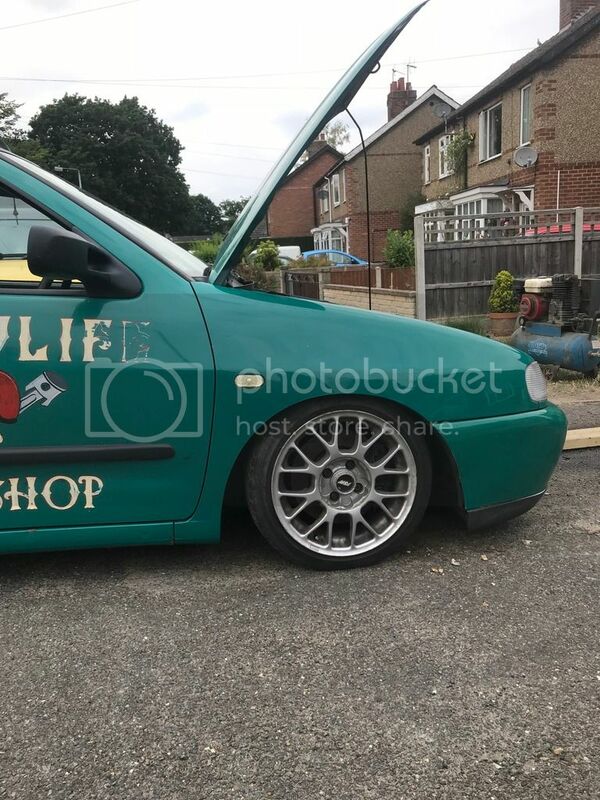 I had to fit my old wheels on for now as the steelies wouldn’t clear the brakes and my other wheels I’ve just had re fufbed weren’t ready for collection. They should have been ready yesterday morning but Friday night I got a message to say the lacquer had run so he tried to cut them back and re do it but it didn’t work so they had to be completely re stripped, powder coated and diamond cut again. I got a message about 3.30pm to say they were ready but I didn’t have time to go and collect them. I had wanted to get all 3 engine raisers in as well but I only had time to do the front mount before packing up and going to work. A shallow sump might possibly be needed looking at this. I can’t get my hand under it, I’m guessing it has 35mm clearance. I went to test drive it but noticed straight away in full lock something wasn’t right. I pulled back on the drive and Rob had a look whilst I turned the wheel. 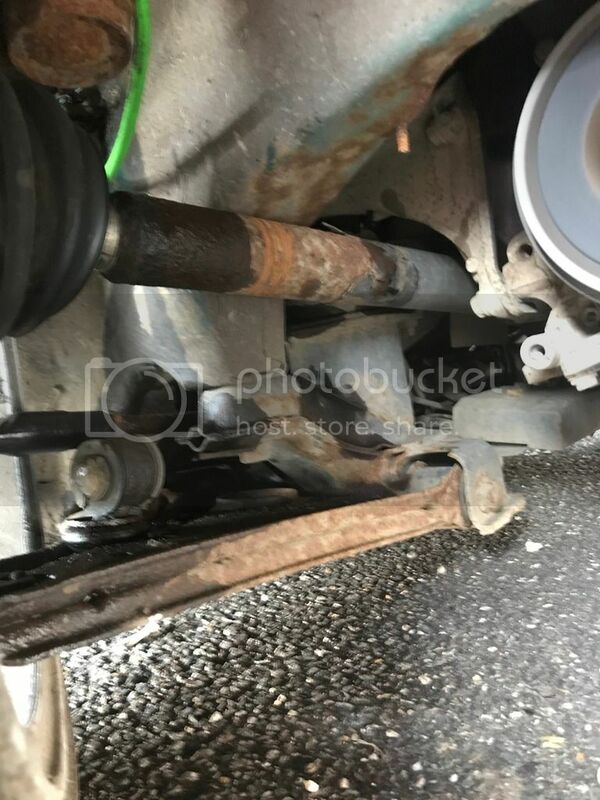 The drivers side drive shaft is rubbing the chassis leg so I’m going to have to raise the coilovers a bit for now until I can get it notched. It also felt sketchy to drive as the tracking and camber is all over the place. I’ll have to try get it somewhere near then take it to be done properly. We had hoped to fit all the engine raisers, strip the rear brakes and fit the new wheel cylinders I’ve got and fit the rear lowering blocks and extended U bolts we made. Unfortunately with the issues we had with the stuck rod ends and brake pipes we ran out of time. 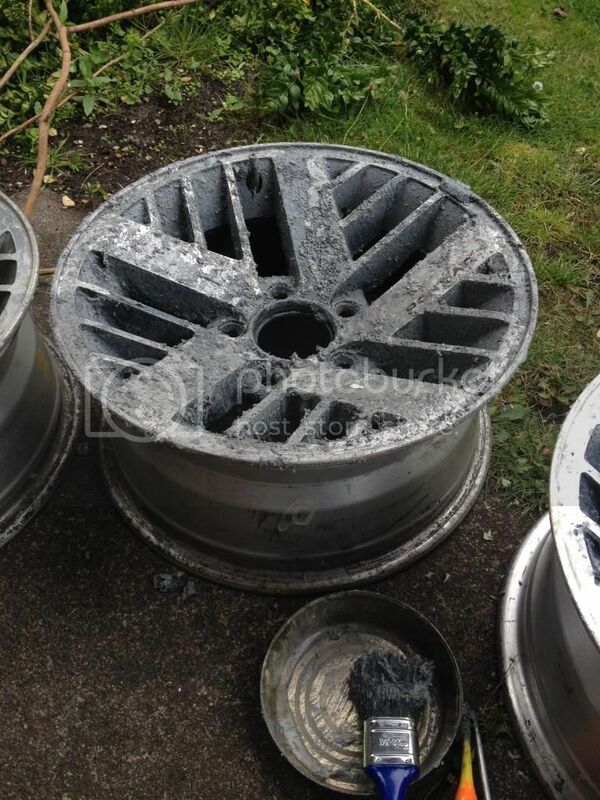 I’ll hopefully get these done before we go to the skegvegas vw show in a few weeks. I’ve just adjusted the tracking by eye. It’s not perfect but it feels better to drive. 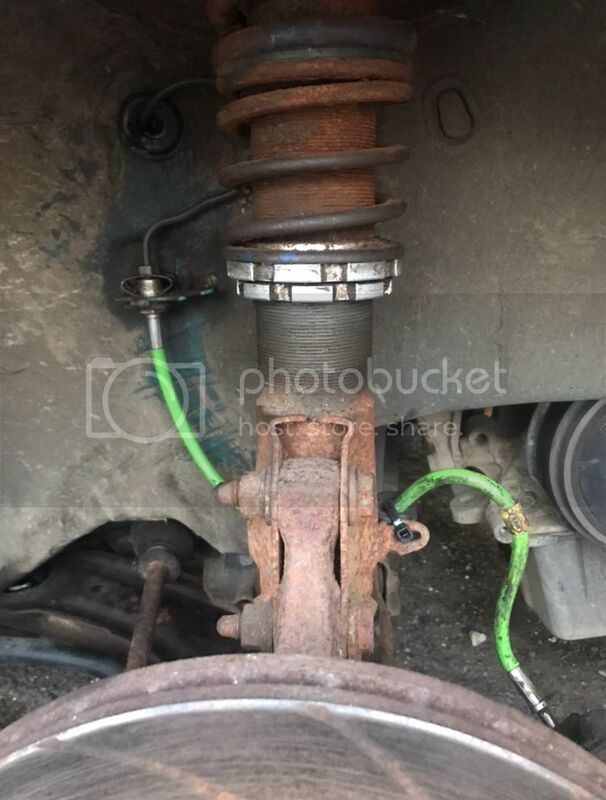 I’ve raised the coilovers a bit but not enough as the driveshaft is still rubbing the chassis leg. I’ll have to raise it some more at some point. 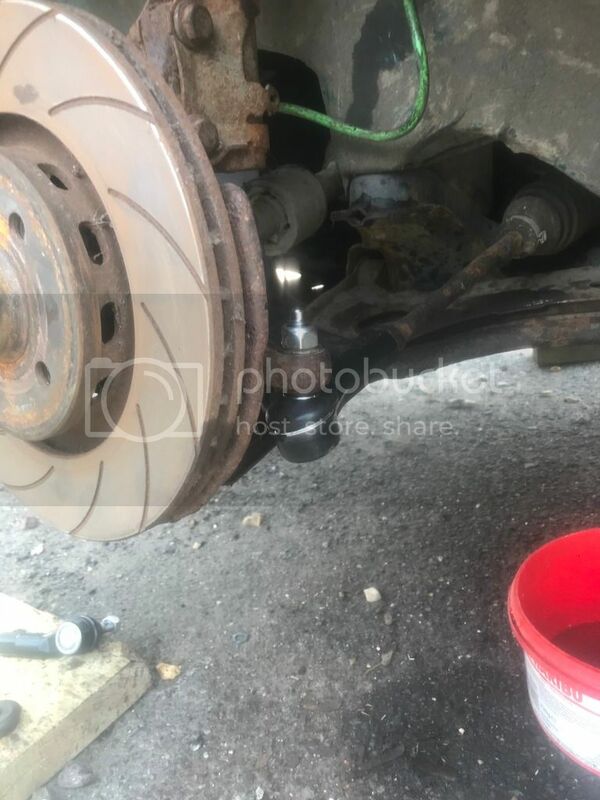 Amazingly even after been stood since 2013 I could adjust the coilovers by hand. I took it for a steady spin around the block. I need to get the other two engine raisers in and possibly a shallow sump as it scraped on loads of bits of the road. Any one got a link to the beetle ones on eBay that fit? Thanks for that. Hopefully the oil pickup will be ok. 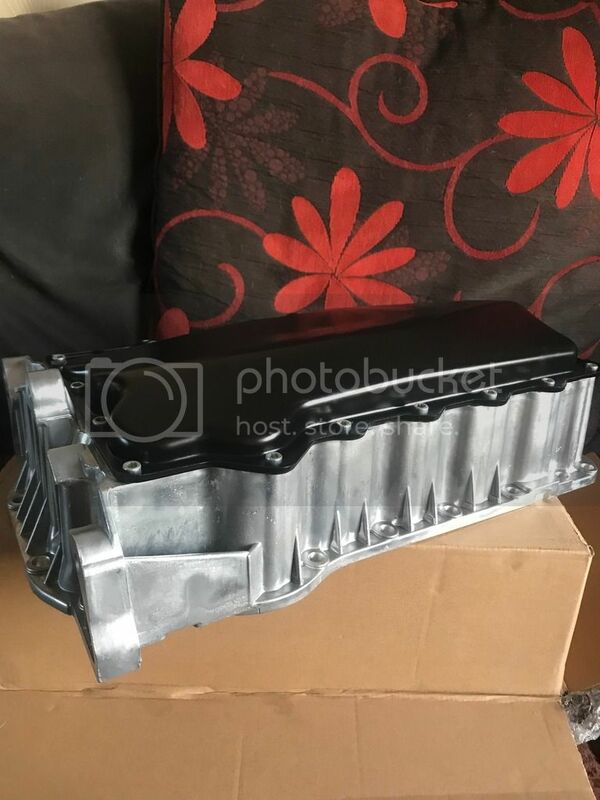 I was talking to Harry about it, he said the golf/bora sump is deeper than the caddy one so they need a shorter pickup when fitting the shallow sump. Finally got the tyres fitted today on the Pontiacs. Trial fit before tyres, looks like it will need some work to make them fit well. As soon as I got home I got on with fitting them. I was right, they are going to need work to get them to sit right. 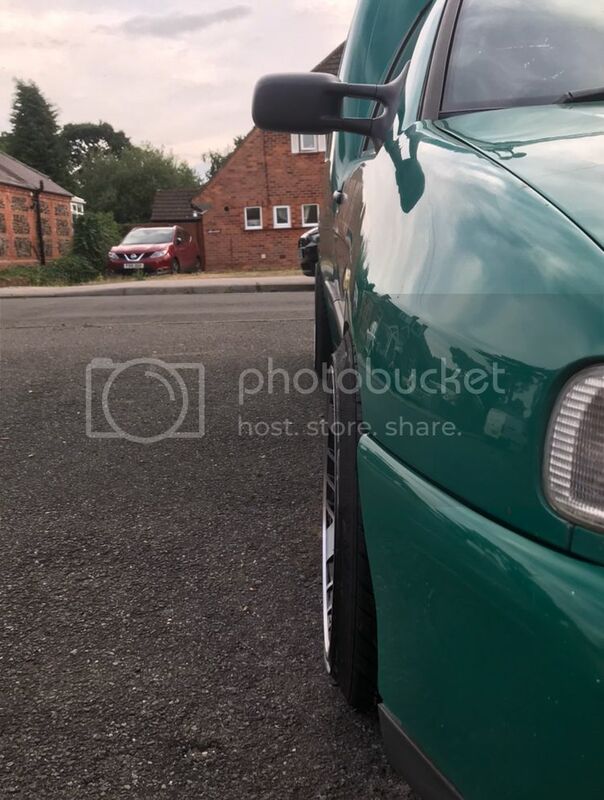 The front adapters are 18mm, I’m thinking I’ll machine them down to 15mm and add some camber. 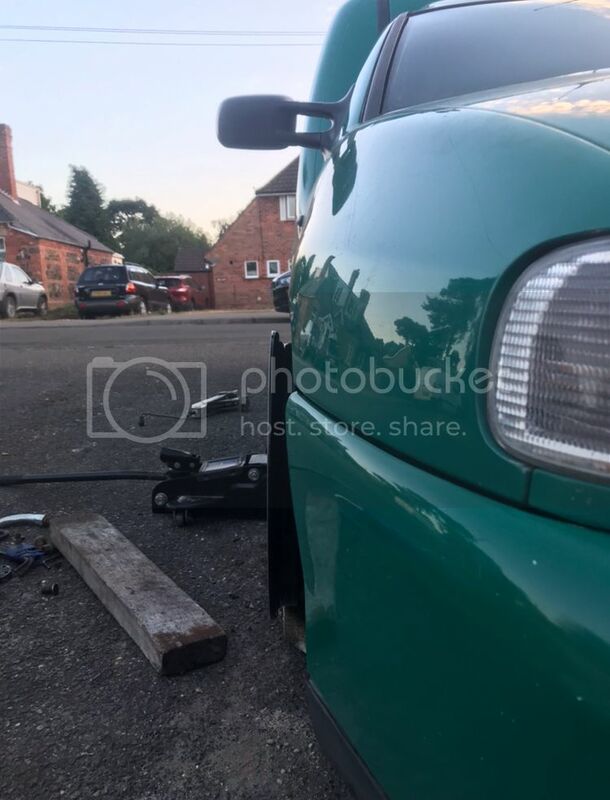 The rears are 25mm, they may get taken down to 20mm. I need to get some spigot rings and maybe matching wheel bolts. 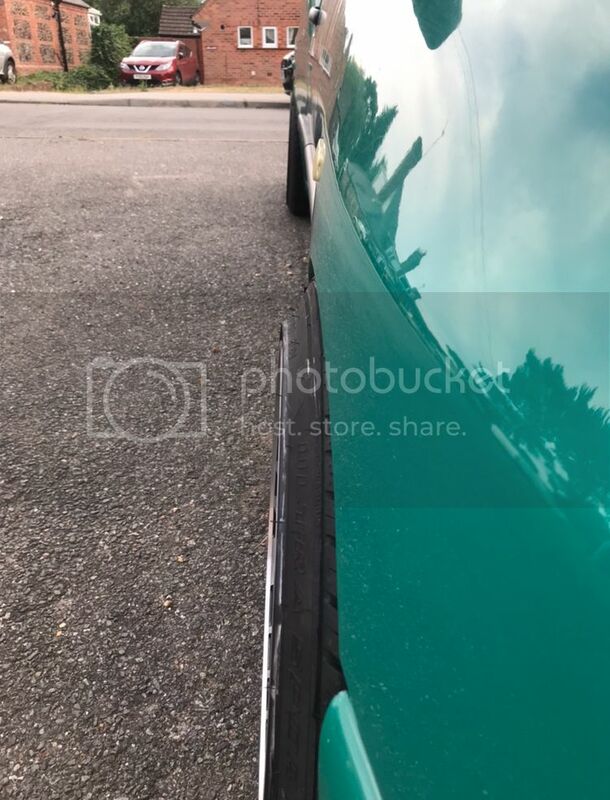 Arches need rolling and camber adding. Hopefully with that they will fit a little better. I’ve had to raise the coilovers up quite a lot so that the drive shaft isn’t sat on the chassis leg. I think this is the highest they have ever been since I’ve owned them apart from possibly when it was mot’d. I’d like to be able to drop it back down after a chassis notch but I think I’ll have trouble with the tyre and arch. 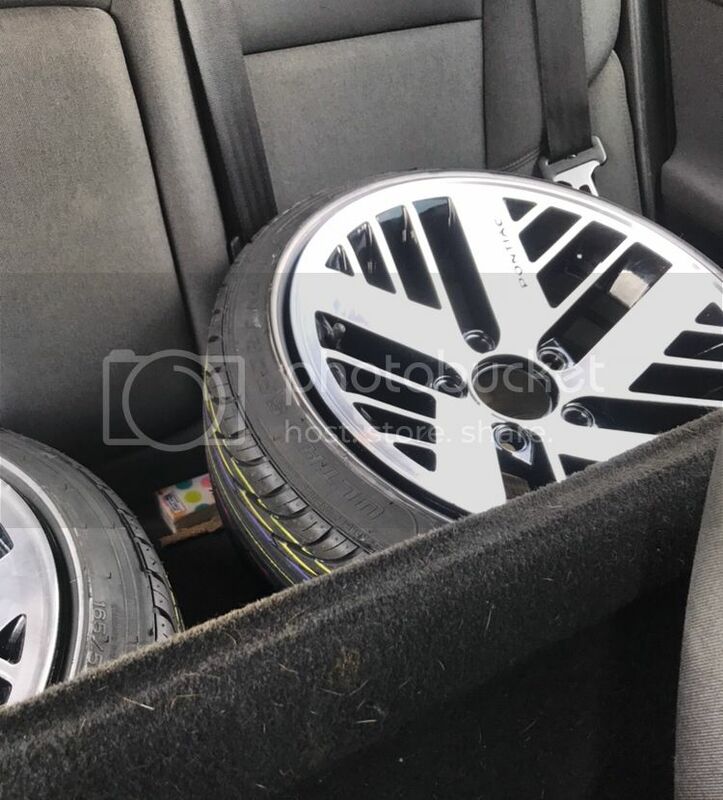 Tell us more about those wheels!! They are strangely fascinating! 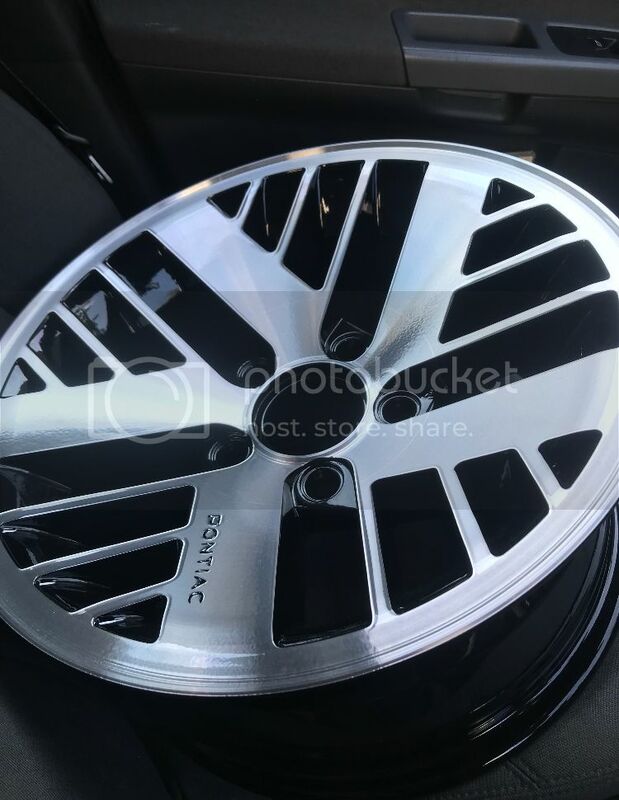 They are Pontiac firebird wheels. 15x7.5 et unsure. 5x120 pcd. Looking back through photo bucket it looks like I picked them up in 2014 for £50. I’d always wanted a set after seeing them on a 6n polo. I bought them and had no idea what I would would fit them to but at the price I couldn’t turn them down. I had planned on refurbishing them myself but I soon gave up on that idea. I got a great quote from a local company, they acid dipped them, blasted them, powder coated them black then diamond cut the faces. Unfortunately for them the lacquer ran. They said they tried to flat it back and re do it but it didn’t work so they had to completely strip them again and start again. Rob popped round after work tonight. 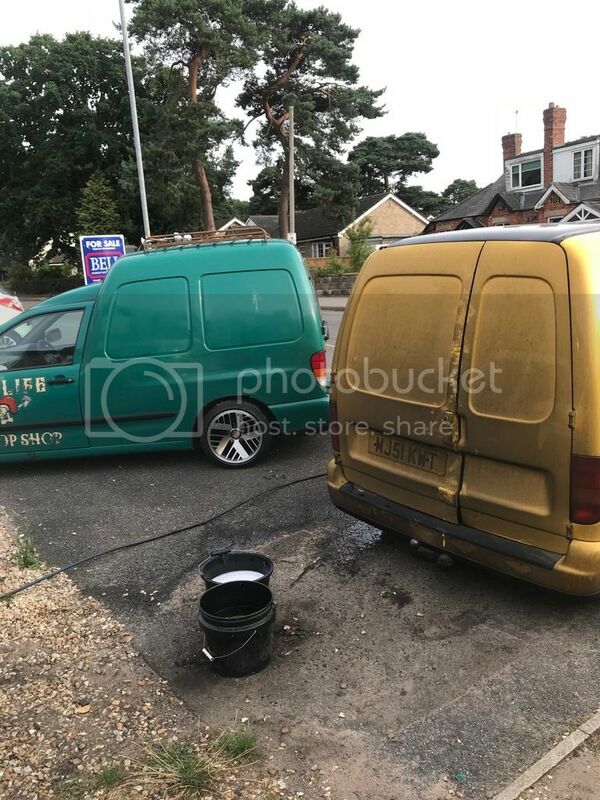 We finally got his van washed, it was a right state. I’ve seen cleaner stuff come out of a sump than what came out of the bucket after. Tonight was the first time I’ve attempted to move mine since fitting the wheels. I knew the arch to tyre gap was tight. I’ve had to ghetto roll the arch for now. 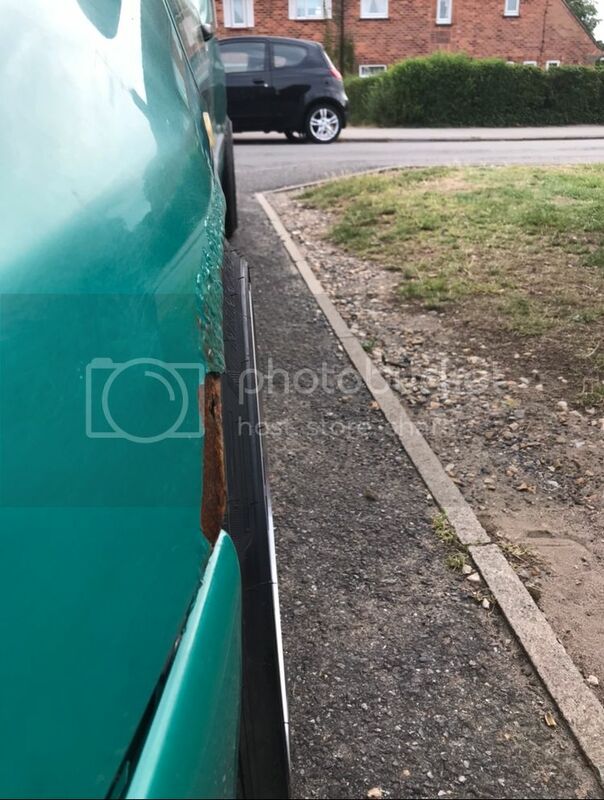 The rears are just falling to bits, they are made up of filler by the looks of it. 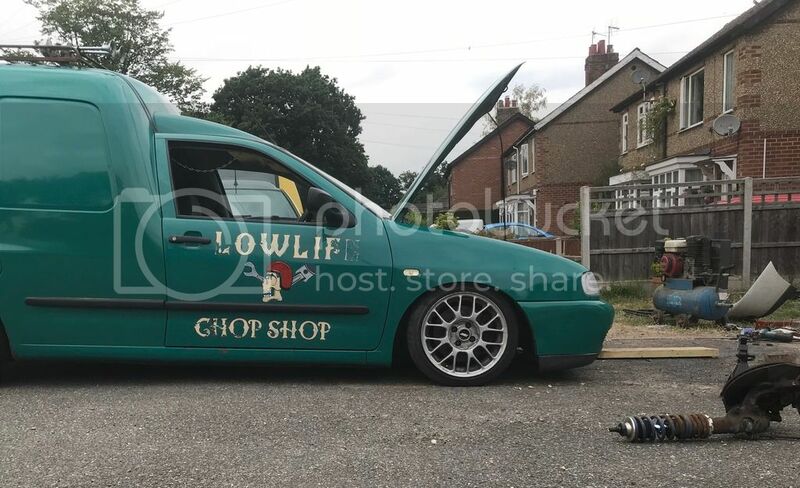 I know it’s only supposed to be the parts van for the project van but it looks like I’m going to end up fitting new rear arches and painting the thing. The bottom big door catch has broken too, it fills the whole van with smoke. Have to drive with Windows down to vent it. I’m still waiting on my rad core for green doors. My mate has had it weeks he just hasn’t sent me his bank details to pay for it. I had a few minutes on the van tonight. I got the gearbox mount raiser bolted in, I’ve just got the rear mount to do now. Not bad for a parts car!